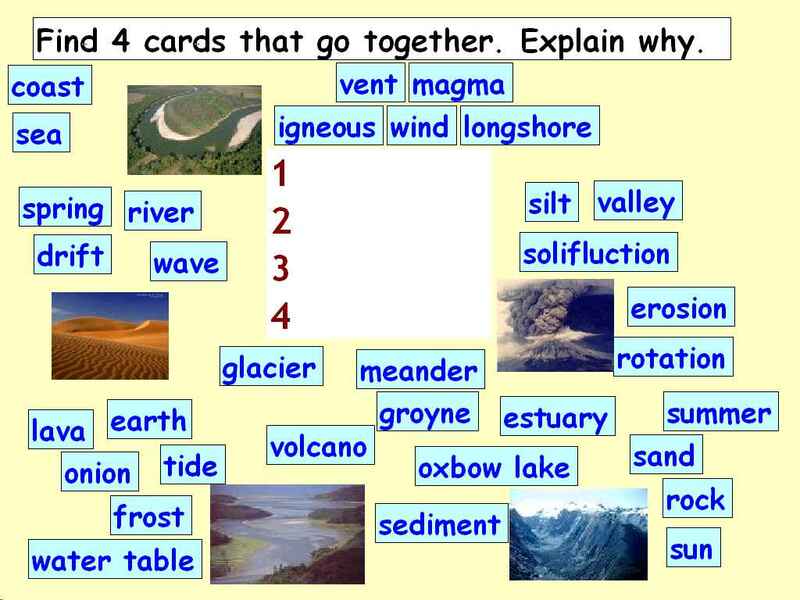 And it couldn't be simpler to run: simply challenge learners, in pairs, to identify four cards that are linked in some way and justify why they go together. You may well get a broader range of considered answers by combining thinking time with paired talk at this stage. One way to think about a misconception is that it is an erroneous connection that a learner has made in their brain. By asking learners to make explicit the way that they connect different words / phrases / pictures / ideas, these misconceptions can be laid bare. Equally, learners sharing different ways in which items can be correctly linked can be a revealing and enriching discussion for the whole class. Initially learners may not be brilliant at articulating connections, even when they have been correctly made. For this activity to have real value you need to be prepared to gently reject answers that do not make sense the first time round, e.g. "I think I know what you are trying to say, Mark, so I'm going to give you and Sandeep a few more minutes to put the connection into words so that it's clear to everyone." If you accept a poorly articulated answer just because you (as teacher) think you know what they are trying to say, other learners will not benefit from the contributor's insight. After a few learner-led selections, you might pick four cards yourself to draw out a specific misconception or illustrate a particular connection. Used within topic of traditional fairy stories – pictures from on IWB (text for HA) ceg bowls of porridge, bed, chair, pumpkin, Prince and Cinderella dancing, fairy godmother, pigs, straw house, wolf, brick house. Children worked with a partner to look at picture and decide which ones went together in some way. After a brief modelling session the children really enjoyed the activity and were able to verbalise why they had made the links they had. An alternative approach which is more in line with Year 1 learning in other areas i.e. maths and science, would be to sort the pictures into three groups and discuss their reasoning. Essentially the same task but more accessible to the children. The tool was used in a year 2 class, as a starter to a science lesson. Pupils were given a selection of pictures and key scientific vocabulary they have learnt during the science topics: materials, electricity and health and growth. Pupils were interested in the activity and fully engaged. Pupils were keen to explain the four words they had linked together and it was an excellent opportunity to assess what pupils have remember from previous topics. It was a superb activity for explaining technical vocabulary and identifying and correcting misconceptions. Tip: It's important to include a selection of vocabulary and images to allow children of all abilities to fully partake. For year 2 I found healthy living pictures and for year 5 I typed healthy living words and displayed these on the Interactive Whiteboard. Children were required to come to the IWB and group 3 or 4 of the items and explain why these items were in the same group. It was a starter activity to introduce healthy Living Week. Both classes enjoyed the activity. Tip: More pictures for Year 2. I had about 15. I found images to represent each final sound we were looking at and children had to come up to the IWB and move the images, explaining why they had chosen them and then trying to spell them. The children were engaged and productive, these visual images and having to think carefully about which went together reinforced the concept successfully. 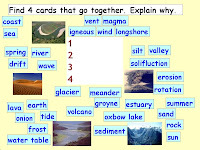 Tip: Obviously the way I set up this activity meant it was not open ended and I had decided which 4 cards go together before the lesson - that's not to say that the children in my group didn't pick different cards and come up with their own explanations of ways they go together which were equally valuable. I'd adapted this from an EAL assessment task with picture cards about journeys - you could do this with any topic you like. Each child chose three pictures that had something in common and explained why. Afterwards we told our own stories using the pictures. The children enjoyed the challenge of finding different ways to link three cards. Children who hadn't spoken much before were captured and interested, and began to talk more in the group. Tip: I found it a surprisingly valuable task, without much preparation time required. You could use pictures from all sorts of places and about a range of topics.